Kwik Kafe's point of use water coolers are a great way to enjoy fresh filtered water without the hassle of a heavy bottle. 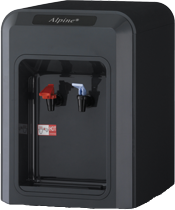 Our water coolers connect directly to your water line so there is no need for bottles. They are available as stand alone floor units or smaller counter top models. Contact Us to see how our filtered water coolers can benefit your business.